For this engagement session in the heart of Historic St Augustine, we really explored the side streets and truly focused on the couple. 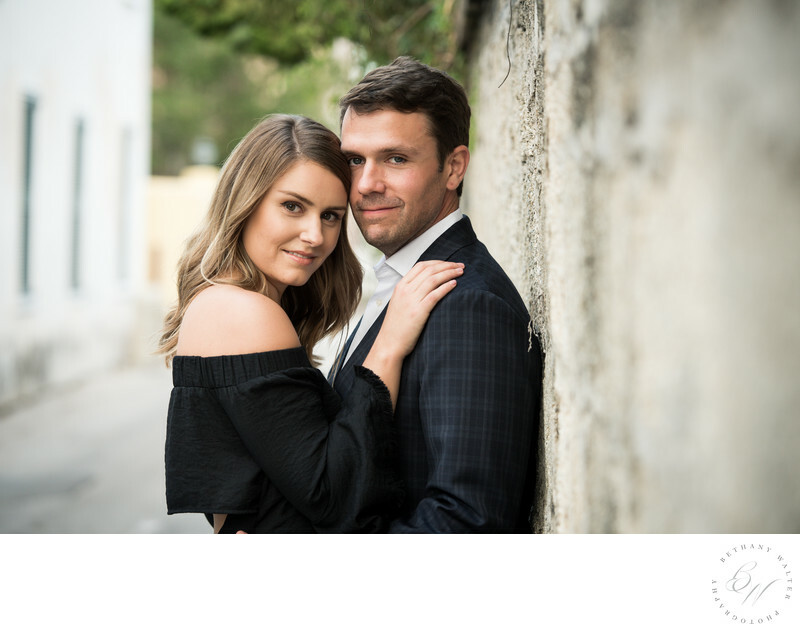 I loved getting to know this couple and cannot wait for their wedding at Treasury on the Plaza, also in the heart of St Augustine! With the soaring ceilings, gorgeous columns, vault bar, available lighting packages, and the history, it is easy to see why Treasury is one of the top venues in St Augustine. This couple is working with a wedding planner, one of my biggest tips for brides and grooms. A wedding day is not the day to wear multiple hats and try to do everything yourself. Having a team of professionals to handle all the details is the easiest way to relieve stress. Sometimes deciding what to wear for a portrait session can be hard. Especially for engagement sessions. Do you want to be dressy, casual, formal? The best thing to do is to dress how you feel confident, comfortable, and great about yourself. If you are not a person who likes to be in a cocktail dress or suit, you're probably not going to feel comfortable in those for pictures. Uncertainty comes across very easily in pictures, so while faking confidence can work, dressing how you feel good is the first step to confidence. Another great thing is to treat yourself to having your makeup and hair done by a professional. For the guys, having a fresh hair cut and shave. Location: 1 King Street, St Augustine, Florida 32084.